News : Pikseliähkylle taiteen valtionpalkinto! Pixelache was awarded the state art prize! 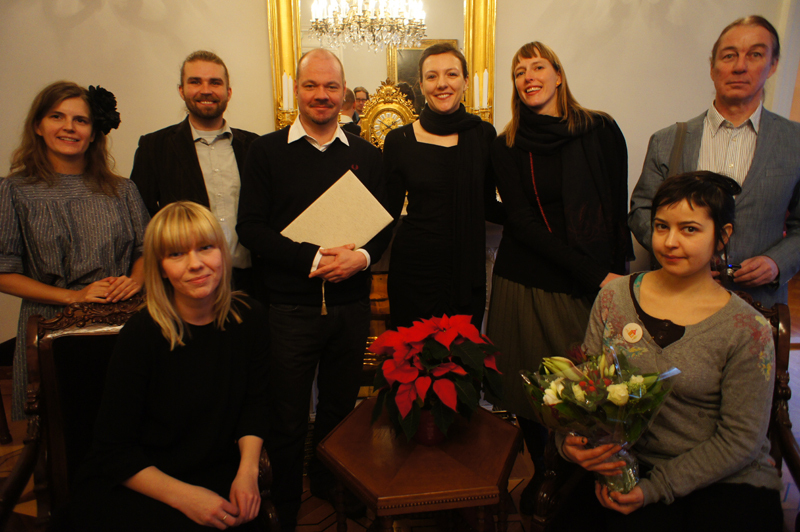 Today a Pixelache delegation attended the State art prize ceremony, to receive from the hands of the Finnish Minister of Culture and Sports Paavo Arhinmäki, an award that is given every year to 1-2 individual artists and 1-2 organisations. This year the prize was awarded to composer Heikki Salo, Saamelaistaiteen tukiyhdistys ry (Sámedáidaga doarjjasearvi rs) and Piknik Frequency ry, the non-profit association that runs Pixelache. For Pixelache, it's a huge honour and the recognition of over 10 years of collective effort. Special thanks to Juha Huuskonen, Ville Hyvönen, Andrew Paterson, Piknik Frequency ry board & members, Pixelache's expert board. A big thank you also, to all our partners and supporters, volunteers and participants to our events of this past decade and to all the people who have made and make Pixelache!